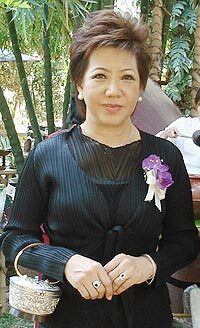 Mom Luang Preeyapun, thank you so much for agreeing to talk with the Chiang Mai Mail. Firstly, I’m sure our readers would like to know something about you yourself. Were you born in Chiang Mai, and have you always lived in Thailand? Mom Luang Preeyapun Sridhavat, the director of the Chiang Mai Ballet School. My family are originally from Bangkok, and are part of the Royal Family; hence I have a title in front of my first name, “Mom Luang”. I was born in Lampang province, my family having moved there on the appointment of my father as a government official. When I was only 6 months old, the family moved again, this time to Chiang Mai province. Could you tell us how old you were when you started to take dance lessons, and about your training? I was 7 years old when I began to study ballet, and my first teacher was a doctor who was working with the Faculty of Medicine at Chiang Mai University, and who had trained in dance in the USA. He had no family, so, in his spare time, he taught ballet to local children and young people. Later, I was fortunate to be able to continue my studies with Linda Campbell, a teacher from Vancouver, Canada. Before you began to teach, did you have a stage career, or was your passion always to teach? If you did perform, did you use a stage name? In the past, as classical ballet was not well known in Thailand, it was not possible to make a career in the world of dance, as one would not have been able to earn a living. Even though I was passionate about dance, my parents would not support me in any way which would have allowed me to pursue a career abroad. I was allowed to dance only as a hobby, and had no choice but to pursue my academic studies. As a result, I gained a Bachelors’ degree in Economics at Chiang Mai University, and later a Masters’ degree in Cultural Management, (specialising in Performing Arts), at Chulalongkorn University in Bangkok. A scene from the classical ballet “La Bayadere”, originally choreographed by Marius Petipa, the “father of dance”. When I was able to have my own income, it enabled me to study outside Thailand. I travelled first to Canada; later I travelled more extensively, visiting ballet schools and dance companies in Asia, Australia, North and South America and Europe, in order to learn about the many different styles of teaching. As it seemed too late for me to embark on a dancing career, I decided to go to London, where I gained my Teaching Diploma with studies including anatomy, child psychology and teaching practice. I became a registered dance teacher at the Royal Academy of Dance, where I stayed for 4 years. After that, I gained the Jazz and Ballet Dance certificate from the Commonwealth Society of Teachers of Dancing, Australia, the Latin Dance Gold Medal from the Imperial Society of Teachers of Dancing in the UK and the Flamenco Dance certificate from Taller Flamenco, Spain. Recently I have been appointed by the Royal Academy of Dance to the position of RAD Practical Teaching Supervisor, which involves evaluating classes given by students who are studying for the RAD teacher’s certificate. You opened your school here in 1987; was this always your ambition? I began teaching as assistant to Linda Campbell, and later briefly taught ballet classes in Chiang Mai for the children of lecturers at Chiang Mai University. I also taught young children at the YMCA and the Yamaha Music School, and went on to teach in London and Singapore. Lately I have been teaching Japanese students in Bangkok. Having gained a great deal of teaching experience, in 1987 I decided to found the Chiang Mai Ballet Academy. I have always aimed for the highest of standards, both in my own work and in my academy, and this approach was rewarded in the year 2000, when HM the King presented the academy with his Royal Award for the highest standards achieved by any Thai dance school. Could you tell us about the school’s development and that of its students? Do you have ex-students who are dancing professionally either in Bangkok or outside Thailand? The academy has been fortunate to have trained many fine dancers over a long period of time. Ex-students have diversified in to many different fields of dance. One girl is now dancing professionally in a Contemporary Dance company in New York, has her artist’s visa and is making a very good life for herself both in the city and in touring across the USA. Two former students are teaching in Australia, others have opened their own dance schools in Bangkok and Chiang Mai, and some are dance teachers in my schools. Many are working in entertainment businesses in Bangkok such as Grammy PLC and R.S. Promotions PLC, others are free-lance dancers for event organisers in Bangkok, and some have become models and air hostesses. There seems to be a growing interest both in classical and modern ballet in Asia; what level of interest have you found here in Thailand? Classical ballet was first introduced into Thailand in 1934; however, the modern dance forms are still not well known here, although some Thais are familiar with them through travelling abroad or attending the twice-yearly performances in Bangkok. Classical ballet has gained more popularity because of its greater exposure both in the theatre, the media and on television. In our previous conversation, you mentioned the benefits to young people of training in dance; could you explain your feelings about this to our readers? Classical ballet training can be of great benefit to very young children in many ways. Posture, in a young child, can be vastly improved, as training straightens the baby “S” curve in the spine, which also becomes lengthened. Full body muscle tone is strengthened, and the muscles themselves are elongated. The grace and erect elegance of movement this encourages will continue into adulthood. During class, exercise releases endorphins, (the “happiness hormone”), a very enjoyable experience for the ballet-trained child. Performing on stage and even the taking of examinations builds confidence and a good personality. Most importantly, ballet training stimulates the performance of the right side of the brain, which is then more able to work with the left side, (which is already being stimulated by academic studies), thus improving the brain’s overall performance. Young dancers learn to count the rhythm, calculate the amount of space a movement will use, and to plan ahead, culminating in skills which will be useful in later life. One of the greatest benefits to a young child is the use of imagination and the creative thinking ability which this stimulates. Even if, in adult life, an academic or other career is followed, there will be so much more enjoyment and appreciation of beauty, wherever it is found, and of the arts, as a result of dance training. What are your feelings about the future of dance in Thailand? 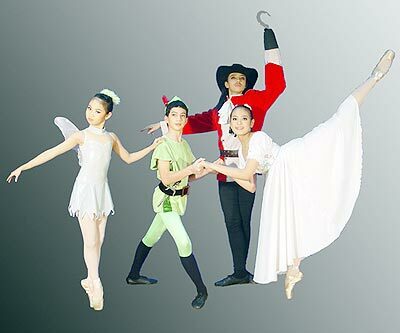 Many students from dance schools in Thailand have already won awards in international dance competitions abroad, and many are earning their livings in Australia, Europe and the USA. These successful ex-students are good examples for young dancers to follow in order to fulfil their dreams of becoming prima ballerinas in the international dance arena. Ballet in Thailand has every chance to become more accomplished and to achieve ever greater success. Please tell us something about the school’s upcoming performances of “La Bayadere” and “Peter Pan” - about the students, their ambitions, their feelings. As a dance teacher, I am always careful to give the best opportunities to my students to gain more confidence and to employ their increasing maturity on stage. Proceeds from the upcoming performance will go to the Chiang Mai Red Cross and the Mentally Retarded People’s Welfare Centre in Chiang Mai. I encourage the students to view the performance as an opportunity for merit-making. This year’s production is a double bill consisting of La Bayadere, a classical ballet with an Indian theme choreographed by Marius Petipa, the father of classical ballet, and Peter Pan 2008, a modern/jazz dance ballet based on the famous children’s book. Amongst the dancers will be 18 dancers who have won international awards from Australia and Singapore, together with a Thai male dancer who trained in Tashkent, Uzbekistan, when the country was still part of the USSR. All of the professional dancers are looking forward to dancing with the students from the Academy, who, of course, are thrilled to be dancing with them. a jazz and modern style ballet based on the well-known children’s story. Some while ago, in a suburb of Brisbane, Australia, a young Thai/Chinese couple, Malee and John, started a Thai restaurant which subsequently became very popular with nearby residents. Because Malee was originally from Chiang Mai, they had decided to call it the Lanna Restaurant. Geoff Crawford and his partner Margaret lived nearby, and had become regulars and friends of Malee and John, particularly as, with their love for travel, they had visited Thailand many times. A good friend of Geoff’s for almost 40 years, Dr. Iain Corness, the Pattaya Mail’s much appreciated medical and motor correspondent, lives in Pattaya, and was another reason for their visits to the Land of Smiles. 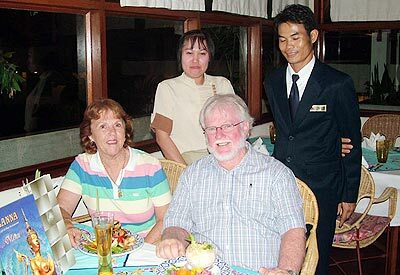 Aware of Geoff and Margaret’s upcoming trip, Dr. Iain suggested that, as the couple were planning to visit Chiang Mai as part of their itinerary, they should eat out one night at a restaurant of the same name in the city, compare food and exchange menus. Which is where the CM Mail came in! Amazingly, we could only find two restaurants of that name, and decided on the Lanna Restaurant at the Amari Rincome Hotel. 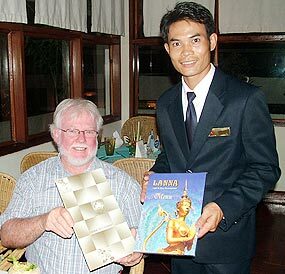 All smiles at the Amari’s Lanna restaurant, with both menus and special Lanna Thai dishes. Geoff and Margaret arrived in Chiang Mai on May 4, having taken the “Jungle Train” from Kuala Lumpur plus an 8 hour bus journey to the south, where they had spent time roaming the islands, swimming, snorkelling, walking and relaxing. Another 8 hour bus trip took them to Bangkok, where they caught a plane to Chiang Mai. As they had already arranged a 4 day trek up into the hills, the Chiang Mai Mail’s columnist met up with them at the Lanna Restaurant on the evening of May 5 for a very special evening. Geoff’s motto, “Life is all about creating good memories”, held true that night; the food, (a very generous and delicious Monday night barbecue, finished off with a seriously wicked white chocolate mousse! ), the conversation, the wonderfully attentive staff fascinated by Malee and John’s Australian Lanna Restaurant menu and their photos, all added up to a night to remember. Then came the surprises. Firstly, as the cameras were brought out, two special Thai dishes, beautifully prepared and decorated, were brought to the table to be included in the photos of menus from both restaurants being exchanged. Of course, they had also to be eaten! Delicious, even though too much had possibly been eaten already… Finally, when Geoff requested the bill, he was told that the entire meal was “on the house”! A generous and perfect ending to a perfect evening. Many thanks are due to Wim Fagel, the GM of the Amari Rincome, and to his staff, for making it truly an occasion to remember. Lanna Restaurant staff, with the Assistant Food and Beverage Manager, comparing Geoff and Margaret’s local Lanna Restaurant menu with theirs! Geoff and Margaret, with the Assistant Food and Beverage Manager at the Lanna Restaurant, Amari Rincome Hotel, admiring the specially presented Thai dishes. Pictured at the Empress hotel, Tananan Willson, (Fashion Designer), Thannaree Portbuntum (PR Empress Hotel), Dr Carolina Thompson (President Soroptimist International), Donna Dauenhauer and Wit from Hair Pro, after a working lunch organising the upcoming Fashion Extraordinaire Fundraiser. The already announced “Taking Action in Style” Fashion Extraordinaire Fundraiser to be held at the Empress Hotel Convention Centre on May 17 is a joint project of which all concerned expat and Thai members of the city’s community should be proud, as it has brought together so many major talents, both in the design and hairdressing fields and in the fields of organisation, volunteering and caring. Here in Thailand, the combined problems of single parenthood and poverty cause desperation and misery to young mothers in that sad situation. Organisations such as the Soroptimists and their many supporters are vital to the welfare of this seriously disadvantaged section of society. Soroptimists International - the word itself is taken from the Greek words “soros” and “optima”, meaning “sister” and “giving the best of oneself” - was founded over 80 years ago, and have more than 90,000 members worldwide; all are women in management and the professions, and all are committed to promoting social justice and the empowerment of women through economic independence and greater participation in decision-making at all levels of society. The Chiang Mai chapter of the organisation is newly chartered, just under one year old, and has already initiated the “Single Mothers’ Project”, aimed at supporting single mothers by reimbursement of medical costs and providing scholarship grants for their children when needed. Other objectives are to liaise with employers who support single mothers, and to provide training in basic business ethics to help single mothers make the necessary adjustments in the work place. The celebrities involved in the Fashion Show are no less committed to the cause of the disadvantaged. Tannanon Willson, Fashion Designer of the Year 2006, (an award given by the Vocational Education Commission of Thailand), is now retired after many successful years designing for celebrities, beauty pageant contestants, concert artists and also the Mayor of Chiang Mai! He is now the treasurer of the Committee of Public Relations and Marketing Association of Northern Thailand, which itself supports many charity events in the north, and is also taking care of his mother’s business, Lok Chai Nerve Massage Institute, since her retirement after 40 years of hard work running a business and raising Tannanon and his brother on her own. The family came form a poor background, and Tannanon feels very fortunate that he has the means and the opportunity to give something back to the local community. The well-known Wit Boonma, owner of the two Hair-Pro salons in Chiang Mai, is also very involved in helping disadvantaged members of the local community, and is particularly committed to the Single Mothers Project. Since last year he has been supporting Mae Wang Hospital by helping to provide meals for diabetes patients, as well as, together with his entire staff and Soroptimist members, travelling regularly to local villages to cut hair for free! He also trains would-be hairdressers at the School for Life. The Chiang Mai “celeb” models who will be gracing the catwalk at the fashion show, together with 8 professional models, will include Anchalee Kalmapijit, of Skål Int and the Elephant Life Experience, Chatima Pingpayom of G-Create Ltd, Duenpen Chaladlam of BTS Travel, Esther Ting of the River Ping Palace, Celeste Tolibas-Holland, volunteer extraordinaire and member of Ferc and Zonta, and Winifred Ho, the “wearable arts” designer. A very special modelling treat will be provided by the guest appearance of Michael Morrow, the US Consul-General, and his wife, Shannon, also a Soroptimist. The show will be opened with a welcome by HSH Dr Mom Chao Duangduan na Chiengmai, and M/C’d by Pim Kemasingki of Citylife and Artchariya P. San Miguel Pratummanee. The renowned Antoine, recently returned to Chiang Mai, will entertain during a superb dinner as will the famed Remi, with her unique style of music. For everyone’s enjoyment, a silent auction with exciting prizes will take place, as well as a Lucky Draw, the Grand Prize of which will be two roundtrip tickets to Bangkok, kindly donated by Bangkok Airways.